Report 1: Where in the world? This report is an updated edition of a report originally published by CBAN in October 2014, called Will GM Crops Feed the World? Updates include information from the five other reports of the GMO Inquiry, published over the course of 2015, to continue a critical examination of the claim that we need genetically modified crops (and animals) to address global hunger and provide enough food for a growing population. The research in this report begins to look ahead to understand what role – if any – GM crops and foods should play in the future of our food and farming systems. “Where in the world are GM crops and foods?” is the first in a series of reports that investigate unanswered questions from 20 years of GMOs in Canada. Watch this space for future reports, and join us as we examine the impacts of GM crops on our environment, on our food and farming systems, and on our health. Subscribe now to keep up-to-date on GMO issues and actions. * You will receive 1-2 emails a month, to keep up-to-date about the GMO Inquiry and ways to participate. You can unsubscribe at any time. This list ends at the end of 2015. Get new research, Inquiry updates and ways to get involved. Thank you for sending us your questions! 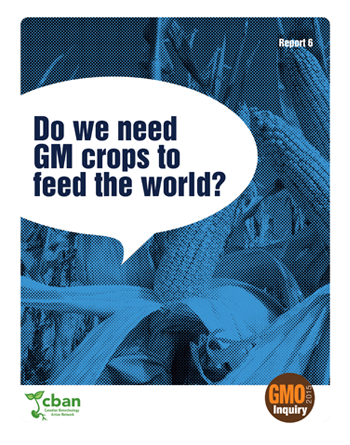 Do we need GM crops to produce enough food for the global population in the coming decades? Do GM crops help poor farmers in the Global South? Is GM “Golden Rice” a solution to malnutrition? How many different GMO vegetables and fruits are grown in Canada? Can you tell me if there is any GMO wheat currently being grown? Help shape the Inquiry! Tell us what you want to know about GMOs. The GMO Inquiry 2015 is a project of the Canadian Biotechnology Action Network (CBAN). CBAN is a campaign coalition of 17 organizations that researches, monitors and raises awareness about issues relating to genetic engineering in food and farming. CBAN members include farmer associations, environmental and social justice organizations, and regional coalitions of grassroots groups. CBAN is a project of Tides Canada Initiatives.